The country is buzzing over news that something big is happening at Ground Zero. Many say the Twin Tower will rise again. They take to their laptops, cells, TVs and anxiously wait. News from the leader of our country will be coming any day. Nothing. 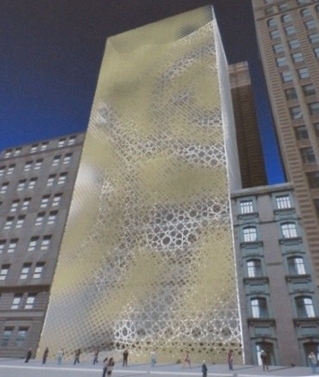 Soon it leaked out that a 13-story Muslim Community Center will be built on the hallowed ground where hundreds were slaughtered in a war against America. Above is the image of Cordoba House that is supposed to contain a mosque, auditoriums, pools and dorm rooms for Muslim men. It mirrors the Twin Towers. On June 6, 2010 pain, fury and disappointment drive the people to the streets in droves. Thousands protest in the United States and other countries as well. Still our leader remains quiet. It is not until August 13, 2010 in the State Dining Room when the president breaks his silence. He is hosting an Iftar dinner in the State Dining Room at the White House. This is the meal when Muslims first break their fast during Ramadan. Anyone has the legal right to build on that site—but do they have the moral right? And where is the president’s support for St. Nicholas? The only church destroyed on 9/11. They have been fighting for nine years to rebuild a formal Greek Orthodox Church and have been refused. New York City officials declare that it’s too big. BTW, there are more than 100 mosques in New York City. This entry was posted in News and tagged America, Cordoba House, Country, Ground Zero, Iftar, Manhattan, mosque, Muslim Community Center, Muslims, New York City, President, Ramadam, St Nicholas Greek Orthodox Church, Twin Tower. Bookmark the permalink.